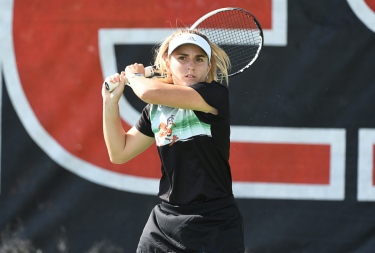 Freshman Estela Pérez-Somarriba started off her Miami tennis career on the right foot this past weekend in the Miami Fall Invite. After struggling with plantar fasciitis for the last eight months, Pérez-Somarriba was back out on the tennis court. Despite being in the United States rather than in her home country of Spain, she looked beyond comfortable, and it showed in her last match on Sunday afternoon. She faced off against Laura Fabrizi of FAU and shined throughout the match. After suffering an opening game loss, Pérez-Somarriba showed resilience and swept the rest of the first set, leading to a 6-1 victory. 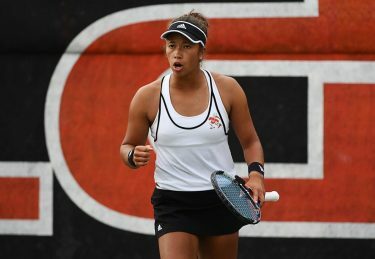 She remained in control the rest of the way while cruising to a 6-2 second-set victory. After the match, Pérez-Somarriba talked about her injury and her move to Miami, highlighting how both have benefited her throughout her tennis journey. However, after coming to the United States, she found herself training harder and getting treatment for her injuries on a more consistent basis. It wasn’t just the doctors and rehab program that got better. According to the freshman, the Hurricanes’ coaching staff deserves just as much credit for her continued improvement. The Canes hope this recipe for success continues throughout the season and helps propel this promising team toward an ACC Championship. But for now, Pérez-Somarriba is content just to be playing again after her long journey back from injury that spanned two continents. “I enjoyed the atmosphere of being out here and the team spirit the most,” she said after the tournament concluded. If she continues to play like she did Sunday, this will be far from her only enjoyable weekend of the season.